The white piano keys are known as the natural keys, because they sound a natural note as opposed to the sharps and flats of the black notes, which we’ll explain in the next section. to press the keys above Middle C. Now do the same with your left hand, this time pressing the keys below Middle C.
There are seven natural notes on a piano: C, D, E, F, G, A, B. You’ll notice that the pattern of two black keys surrounded by three white keys then three black keys surrounded by four white keys repeats itself several times up the keyboard. 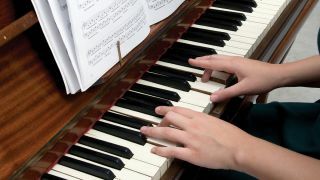 The keys run in alphabetical order from A to G. The three white notes surrounding the two black keys are C, D, and E, and the four white notes surrounding the three black keys are F, G, A and B. So, if you count eight keys right from Middle C (or, indeed, eight keys left) you’ll be back at C. The musical distance between these two notes is what’s known as an octave. Step 1: With your right hand, locate three white keys in the middle of the piano surrounding two black keys. Place your thumb on the leftmost of these keys; this is Middle C. To the right are D, E, F and G. If you have a full-sized 88-key keyboard, Middle C is the 24th white key you’ll count from left to right (the fourth C). Step 2: Once you’ve found where Middle C is, you can have a go at your first basic melody. Try the following tune, which is the first line of Mary Had A Little Lamb, and see how you get on: E-D-C-D-E-E-E-D-D-D-E-E-E. Once you’ve mastered that, see if you can work out the rest. Step 3: Again find Middle C, but this time place your left thumb on it. To the left of this key the notes are B, A, G and then F. If you keep going left, you’ll arrive at C an octave lower - you won’t have enough fingers to go that far though, so you’ll have to move your wrist. Step 4: Let’s try the last line of Mary Had A Little Lamb with the left hand. Put your left little finger on Middle C (so you’re essentially in the same position as step 2) and have a go at the following: E-D-C-D-E-E-E-E-D-D-E-D-C. Make sure only your little, ring and middle fingers move as they’re the only ones that need to. From Middle C the keys move up and down alphabetically. So,to the right it’s D,E,F,G,A,B and then C again. To the left it’s B, A, G, F, E, D and then C an octave lower. If you go eight notes (including Middle C) to the right you’ll be an octave higher. You’ve actually just done your first scale; C to C is known as C major, but more on that later. Once you’ve learnt one set of eight white keys, you’ve learnt them all! The pattern repeats all way up and down the keyboard. The white key to the left of two black keys will always be C, no matter where you are on the keyboard. Go eight notes (including Middle C) to the left and you’ll be an octave lower. The three white keys around the two black keys are C, D and E, while the four white keys around three black keys are F, G, A and B. Play the white keys between these two C notes (C, D, E, F, G, A, B, and C again) and you’ll have played the C major scale. Play these notes in any order and it should sound good.